RFA May 11, 2017: A human rights defender held in detention for online activism is in poor health and has been refused visits from her family, according to her lawyer, who met with her Thursday for the first time since she was arrested nearly four months ago. Tran Thi Nga, 40, was arrested on Jan. 21 in Phu Ly, the capital city of northern Vietnam’s Ha Nam province, and charged under Article 88 for “using the internet to spread propaganda videos and writings” against the state. The labor and land rights activist also known as Thuy Nga faces up to 20 years in prison. On Thursday, Nga’s lawyer Ha Huy Son met with her at the Ha Nam Police Detention Center and told RFA’s Vietnamese Service that she is suffering complications from an injury she sustained in May 2014 when a group of men armed with pipes assaulted her for her campaign work. “Her health is not so good—she suffers from knee pain due to the brutal attack some years ago,” he said. In a video of the 2014 attack, assailants beat Nga while she rides on the back of a bicycle with her children, chase her into a nearby car dealership, and return three times to inflict harm. The assault sent her to the hospital with an arm and leg in bandages and splints, and left her body covered in swollen bruises. Meanwhile, Son acknowledged that the charge against Nga under Article 88—for what is considered a “national security offense”—allows for her incommunicado detention throughout the investigation of her case. “In accordance with the law, she is only entitled to meet her defending lawyer,” he said. Son told RFA that he was unable to copy Nga’s case documents during Thursday’s visit because a representative of the prosecution was not present, but said he would try to do so when he next meets with her. “If she is formally prosecuted, [her case] would take at least two months,” he added. Nga is well known for defending the rights of Vietnamese migrant workers and victims of government land grabs. The seizure of land for development—often without due process or fair compensation for displaced residents— is a major cause of protests in Vietnam and other authoritarian Asian countries, including China and Cambodia. 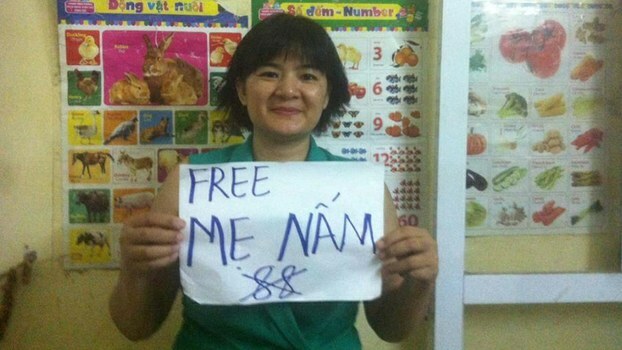 In February, more than two dozen Vietnamese civil society organizations and nearly 850 individuals signed a petition demanding Nag’s immediate release. According to the petition, Nga was harassed, attacked, and monitored before her arrest, and was innocent when she carried out her peaceful activities advocating for human rights and democracy.